Improving the customer experience is important, perhaps even strategic. Online data entry prior to the visit can be a useful improvement. This easily and understandably translates to “We need online data entry to improve our customer’s experience.” So, at the surface, it makes perfect sense. Which is why we need to stop our thinking and start really listening to our stakeholder. Whether customer experience improvement is the trigger for the idea, or if there is another trigger for this specific solution and the stakeholder linked it to strategy afterwards. In what way different aspects of the proposed solution will improve customer experience. What data precisely, and why this specific data? Why online? Is that at home, or in a branch office’s waiting room? Why prior to the visit? So don’t start questioning these triggers, but accept them as the starting point of an interesting conversation, in which you try to find out both the underlying concerns and how the stakeholder believes his solution suggestion will contribute to tackling these concerns. Some customers applying for a loan are uncomfortable with explaining their financial situation in an environment that doesn’t offer full privacy. Gathering basic financial information is a cumbersome activity that doesn’t add much value for the customer or the loan specialist. It also happens that the customer doesn’t have all necessary data with him, making it hard to give the customer a valid offer quickly. the way the stakeholder thinks different aspects of his solution suggestion will help achieve these goals. To support this conversation and to validate my understanding of the stakeholders’ reasonings, I find the benefit map a powerful tool. It’s visual. It quickly gives you a complete picture of the idea and allows you to highlight gaps visually. It allows you to focus on how different aspects of goals and solutions are connected, instead of each goal or requirement by itself. This helps understanding the importance of different solution features. It triggers further exploration of both the problem and the solution space, which is what you want before jumping into project execution mode. It is easy to create, even live in a workshop. You can for example use post-its that you re-arrange in real time, building the chain from goals to solutions together with your stakeholder. Data entry in a private environment increases the customer’s sense of privacy. Online data entry improves the quality and completeness of the data, enabling quick loan offer proposals and making the loan application process more efficient. Up front data entry also improves the efficiency of the process by having the loan specialist do what he’s best at. The hidden gem is that now, we have described what we can do in order to achieve our goals, without telling how we could do it. We can enable the loan specialist to create a valid offer quickly. We can make sure the loan specialist focuses on value adding client advice. 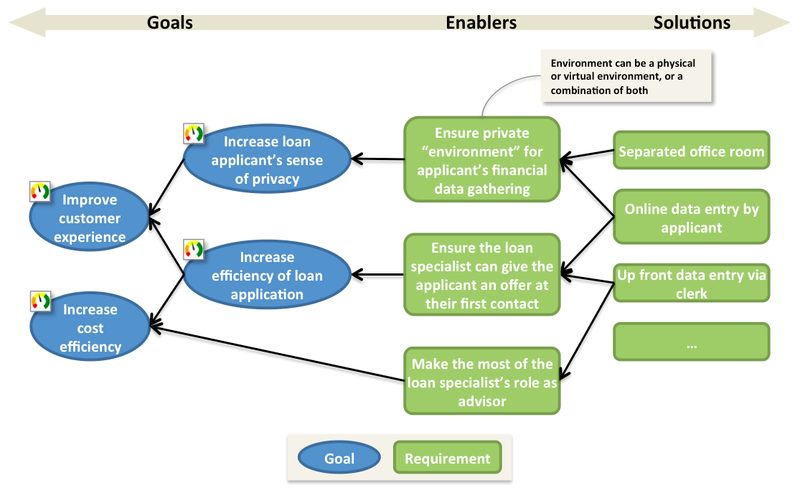 Carefully specifying the enablers between the goals and the solution, highlights why we believe our solution is a good one, helps identify gaps and creates room for solution alternatives. Are you using the benefit map or another tool in this way? What’s your experience with it? Photo by Lalesh Aldarwish on StockSnap.io. 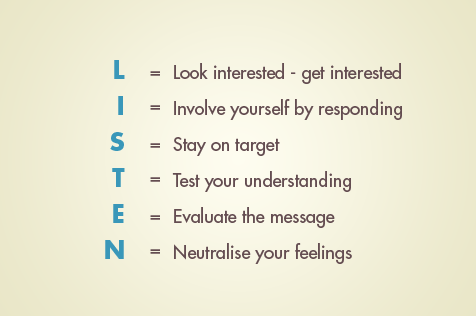 The listen image comes from this London Deanery Multiprofessional Faculty Development web site. It’s used in a different context, but I find the article very relevant for BAs. The post-it benefit map was created by Rachel Henry-Jones, Tomáš Landovský, Adrian Reed and Aleš Štempihar during my workshop at the Business Analysis Conference Europe 2015.